Less than a few minutes walk from the famous Bondi Beach, this light filled, spacious home is perfect for your next holiday rental. A range of cuisines, bars and specialty cafes? Check. Family friendly parks and playgrounds? Check. Children's pool at the north end of the beach? Check. Airy yoga studios, galleries and local designer shops mingle with the parks and markets to create a backdrop to the truly spectacular Bondi Beach. Whether you’re an active morning person, a sleep-in-and-enjoy-the-sun person, or an explore the nightlife kind of person, iconic Bondi has everything, all within walking distance to boot. The large, comfortable home is fully furnished and self contained, and boasts 5 bedrooms across two floors, with space to sleep up to 11 people! Master Bedroom with queen bed and king single sofa bed + en suite. Pet friendly, with prior agreement with management. Prices start from $600 per night, long stay, low season and up to $1250 per night for last minute 2-3 night stays. Security deposit payable 7 days prior to arrival: $1500 AUD. Dave H., October 2018 - "Excellent communication from booking to arrival, excellent facilities, excellent location." Thrupp Family, October 2018, "106 is in a fabulous location, couldn't ask for better. The rooms were perfect for our large family group and there was enough space to relax in. Mitchell was very helpful and welcoming on our arrival and was keen to make sure that we felt at home. It was great to have enough towels and access to more if needed especially with young children in the group. All in all we were very happy with the accommodation and had a wonderful stay." Roz, April 2018, "Just a thank you for sharing the home. The location is excellent, whether you like to eat in - fresh food shopping just around the corner or dine out - so many choices within 2 minutes walk. No need for a car. considering how close the home is to all the entertainment, restaurants it is a very quiet area. Bedding was comfortable, spacious rooms and plenty of room for relaxing. And of course, the beach and the walking. This Bondi home has it all. It was ideal for us and our family." Jackie L., September 2017- The house was beautifully presented and very clean and tidy. Everything was that you could think of in a home was available for you. You could not ask for a better location to restaurants shops and the scenic Bondi Beach. We had a fabulous stay and Deb and Derrick were a pleasure to deal with and really looked after us. Jo W. July 2017 - This was a fantastic property for the purpose of our trip. We were a group of friends staying together as our daughters were competing in national calisthenic comps at NIDA. The booking process was easy and all communications were quickly responded to which was much appreciated. The property itself was fantastic and suited us perfectly as we were all able to have our own bedroom. The furnishings were lovely and the property was very comfortable. We couldn't believe Bondi Beach was so close and within easy walking distance. The only thing I would mention is that there was a shortage of champagne glasses. There was only one which I am guessing is a result of others having been broken. We purchased a set of 6 and left them at the property for future guests to enjoy as our gift to your beautiful house. We wouldn't hesitate to book this property again. Our whole group loved it. Thanks so much. Lyn, April 2017 - Great location - couldn't ask for better. Great comfy house. Genea, April 2017 - The house was perfect for a large family, close to everything and the public transport was great. Deborah was very helpful and would definitely recommend her. First time I've used airbnb so was a little nervous but I'll definitely be using it again. Sharon, January 2017 - Thank you Deborah for the use of your home for our family break. This house is in the perfect location to absolutely everything. Restaurants, beach, public transport and shopping. Parking was a definite plus too. Your house is very big with plenty of rooms & bathrooms. We did, however find the house very hot in the night due to strict air conditioner rules. Excellent accommodations for our family holiday . We enjoyed the dining room and patio dining tables for our meals. On arrival the blind in the front downstairs bedroom was broken, not fixed during our stay. The barbecue had not been cleaned - we rectified that ourselves. Anything else needed was taken care of during out time there. The lockbox key program worked very well as we went our separate ways often. The location of the house is perfect and we would recommend it to all. "The location was the highlight as we could walk to the beach, cafes and shops everyday. We would recommend this house the large families! We had a great stay in Bondi, the house we big enough for our family and close to the beach." Samantha - The house is just as described. 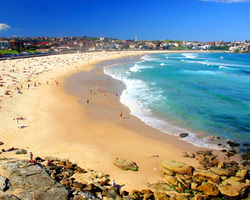 The big surprise for us is the location, it's just a few minutes to the Bondi Beach, and has so many shops surrounding. Vicky - five minute walking to Bondi beach with all shops super market around, very convenient location, kids and grandparents all enjoy their first sight of Sydney with our first stay house. very thoughtful preparation on enough beach towels. Kim - My family had a wonderful time staying at this lovely home. It had everything we needed. It was clean and very spacious and was in the perfect location for staying at Bondi. Very close to everything from the beach to many coffee shops, restaurants and shops. I definitely would recommend staying here to anyone interested. Tomas - Great house, clean and super well located in Bondi Beach. Hosts were friendly and easy to reach. We had a good experience in this house 100% recommendable. Praveen - We had a great stay at Deborah's place. It's extremely spacious and accommodated our family quite easily. The bedrooms are roomy and the large living room with the backyard is great for a family with kids. Deborah was very easy to get hold of and had made excellent arrangements for us to settle in on the day of our arrival. All the amenities were to our liking. The best feature of the beach house is it's proximity to Bondi beach (about 100 meters away). It's also very close to great restaurants and grocery stores. Staying at the beach house made us feel like we were part of the Bondi community and we will definitely look to make a booking again. Response from Deborah:Thanks Praveen!!! So happy you enjoyed your stay! See you next time, or maybe in Singapore!! Great house, great location! UK adapters would have been useful, other than that we found EVERYTHING and more that we needed. Great location, so handy for beaches, town, etc. We had 10 staying here and still had our own space. Would recommend to anyone and hopefully we will be back one day. Loved the house, it was cute and homely. I had a great time with the family, the size of the house provided easy living. Thank you, we might stay in the future. Just a note to let you know that we thoroughly enjoyed our time in Sydney. The house was everything we needed and more. We loved beautiful Bondi Beach and the easy access to circular Quay. We did not end up needing an additional bed but got a good laugh when we discovered the differences in languages. When I asked for a "cot", I apparently meant "trundle"...but we didn't need either. Derek gave us a good orientation and answered a couple of questions along the way. Everything was wonderful. Even the weather. I thank you very much for your help. We stayed at the house for 7 nights. We had 6 adults and 2 children. There was plenty of room for everyone. The house is only 100 metres or so from Campbell Parade and very close to the great new restaurants along Hall Street. The street is a dead end street so there is no through traffic. So even though we were so close to the action, it was very quiet at the house. We could here the next door neighbours but apart from that we heard very little street or loud noises. There was a nice courtyard at the back of the house to soak up the sun or sit in the shade under the trees. I didn't step foot in the kitchen except to pour myself another wine, but my sister used it quite a bit to organise meals for her children and she seemed pretty happy. The layout of the ground floor is - 2 x queen bedrooms, bathroom (with bath), kitchen and lounge and upstairs there is a queen bedroom, bathroom, a twin bedroom and the main bedroom with a queen bed, king single rollaway, walk in robe and ensuite. This room has a little verandah too. The 2 queen beds upstairs were very comfortable but my sister did complain that the queen bed in the room at the front of house was a bit hard. The booking process was very easy and all dealings with Deborah were great. I would highly recommend this property for its location, value for money and amenities. Bondi is a fantastic place to stay. Great restaurants and bars, the amazing beach, cliff walks and the shopping is a lot better than it use to be. This was a very large house that slept 9 adults and 2 kids very comfortably. The location was great - close to transportation and the beach. It was very well equipped. We enjoyed our stay very much. The house was amazing. My friends and I visited Sydney from the United States for a wedding. Large spacious living room so everyone can relax. The house is located in the perfect location in bondi beach. 1 block away from the beach and all the restaurants, bars, etc in Bondi. Definitely recommend it for anyone looking to spend time in Sydney at the beach. We had a great weekend, fantastic opportunity fior the whole family to get together. We loved the house and the large living area and excellent location. We hope to do it again another time. Awesome time had by all. Great location and the house is absolutely beautiful. Will definitelty be back sometime soon!! Nothing missing - it has everything!! Deborah, thanks for allowing us to use Ruby's at Bondi Beach for the weekend. Great house. Rubys at Bondi Beach is a comfortable and roomy home away from home. Our group of 8 female friends enjoyed the handy location to nearby shops, beach, restaurants, cafes and bars - as well as the individual space that this 5 bedroom home offers. The home was clean, beds comfy, and all the amenities that you would need. I highly recommend Ruby’s to anyone looking for quality accommodation at Bondi Beach.